02nd February 2019, Jeddah; In the presence of Prince Khalid bin Sultan Al Abdullah Al Faisal, President of the Saudi Federation of Automobiles and Motorcycles, and David King, Aston Martin Vice President and Chief Special Operations Officer, Haji Husein Alireza & Co. Ltd. inaugurated its all-new Aston Martin showroom in Jeddah on Wednesday 30th January. 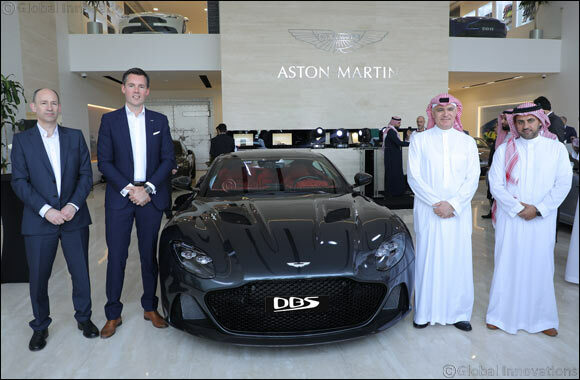 The private reception was also attended by Dan Balmer – President Aston Martin Lagonda Middle East, North Africa & Turkey, and a select group of customers and media representatives. The impressive 521-square-metre showroom, the third for Aston Martin in the Kingdom, is centrally located on Tahlia street and showcases a full line-up of the latest second-century Aston Martin models, including the DB11, Vantage and DBS Superleggera. Designed to the highest standards, it consists of a main showroom, an area dedicated to demo cars, an innovative car delivery space, Q Lounge and a specialised configuration zone. Drawing focus to Aston Martin’s commitment to environmental responsibility, use of cutting-edge technologies and its continuous quest to pave the way for development in the automotive industry, a Rapide E cutaway model was showcased at the event. Recognised as the world’s first electric four-door luxury GT, the Rapide E is Aston Martin’s first Battery Electric Vehicle, developed with a limited production run of 155 units with Williams Advanced Engineering. The Rapide E will be powered by an 800V battery electrical architecture – the first BEV to market with such high capacity – which powers two rear-mounted electric motors producing a combined target output of just over 610PS and a colossal 950Nm of torque. Projected top speed for the Rapide E is 155mph, with a sub-4.0sec 0-60mph time and a 50-70mph time of just 1.5sec, while retaining and enhancing the feel, character and delivery of the V12-engined Rapide S.
The Jeddah official opening also saw the DBS Superleggera unveiled for the first time in the Kingdom. Clad using immaculately sculpted carbon fibre body panels, this latest model has muscular and highly individual styling. A look that’s perfectly matched by epic performance courtesy of Aston Martin’s 5.2-litre twin-turbo V12, tuned to produce tremendous power and immense torque for breath-taking response and extraordinary in-gear performance. As the British marque’s magnificent new Super GT flagship, DBS Superleggera replaces the esteemed Vanquish S. With 725PS, 900Nm of torque, a top speed of 211mph and blistering acceleration that dispatches 0-62mph in just 3.4 seconds and 0-100mph in 6.4 seconds, DBS Superleggera is a car dedicated to delivering an unforgettable driving experience and class-leading in-gear acceleration, with 50-100mph achieved in fourth gear in a mere 4.2 seconds. “The DBS Superleggera goes beyond the limits in celebrating the return of one of the leading names of the Aston Martin brand. Surpassing standards, it boasts remarkable features and dynamics that have been carefully honed to engage drivers wishing to own a car with a distinctive and powerful design and engineering feel, making it a true milestone for Aston Martin,” added Alireza.